Looking for competent method development / validation experienced professionals to be an integral part of our Central Validation Lab for our Formulation /API plants based at Panelav & Karakhadi in Vadodara, Gujarat. Alembic Pharmaceuticals is looking for competent personnel to be a part of their new Manufacturing Teams of Formulation OSD and Injectable plant based at Panelav and Karakhadi, Vadodara. 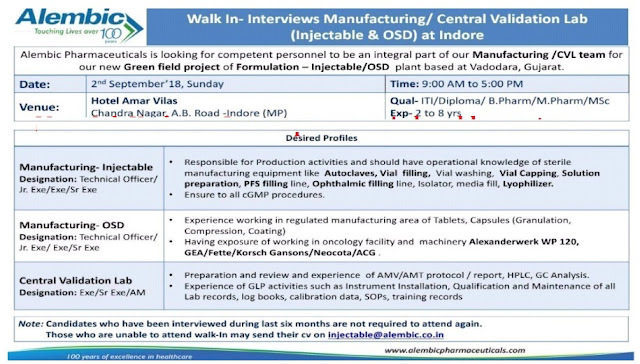 Interested professional matching the requirement may join us for Personal Interview on 2nd Sep 18, Sunday from 9:00 AM at Hotel Amar Vilas at Indore. Location 1 - Vadodara, Gujarat.